Central to most sociologists’ self-image is the claim that their theories are based on research. 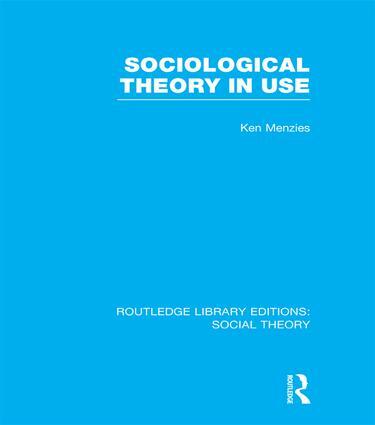 However, using a random sample of 680 articles appearing in major American, British and Canadian journals, Dr Menzies shows that in some areas of sociology the wide gap between theory and research means that much of sociological theory is virtually untested. He explains how theory is embodied in eight particular types of research, critically examines these research theories, and contrasts them with the positions of modern theorists. The sample of journal articles also permits a comparison of British, American and Canadian sociology. By contrasting on how researchers us theories, Dr Menzies is able to reassess several theories. For instance, symbolic interactionist research uses embedded causal claims and stands in a dialectical relationship to other sociological research, while the research version of conflict theory depends on external causes to explain social change. The implications of using statistical techniques like factor analysis and regression are also considered in relation to the form of explanation.